A crew of scientists are searching off the Washington coast for pieces of a large meteor that splashed down in March, and will announce their findings Tuesday morning. 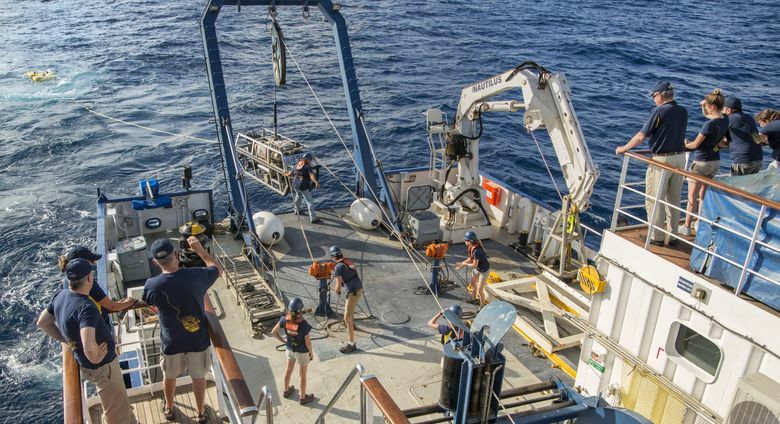 UPDATE: Scientists onboard the EV Nautilus started their search for meteorite fragments Monday and continued through the afternoon. They plan to announce their findings — if any — Tuesday morning. You can follow the hunt live online and send questions. The crew didn’t spot any large chunks that might be space rocks. But they have used underwater robots to “slurp up” multiple sediments samples. Scientists planned to sort through the sediment Monday evening. The water at a depth of about 300 feet was murky due to surface swells of six to 12 feet. Brittany Bryson was sitting at a fast-food drive-up in Ocean Shores the evening of March 7 when a bright flash lit the sky, followed by a boom so loud it rattled her car. Minutes later she fielded a frantic call from her sister, who had been outside with Bryson’s kids. “They thought it was a spaceship,” she recalled. Scientists confirmed that the celestial fireworks visible on the coast from British Columbia to northern Oregon were caused by a meteor slamming into the Earth’s atmosphere. Now, researchers think they may be able to retrieve some of the shattered bits from the seafloor off the Washington coast. If they succeed, it would be a first, said Marc Fries, NASA’s curator of cosmic dust and also a dogged meteorite hunter who helped orchestrate the fishing expedition set for Monday, July 2 — weather willing. “Nobody has ever done this before,” he said. Fries is optimistic, partly because the space rock that exploded in a fireball and sonic boom — a phenomenon called a bolide — was huge. “This is easily the biggest recorded meteor fall in the United States in 21 years,” Fries said. He estimates the hurtling rock was about the size of a golf cart. He used weather radar to locate the splashdown zone about 16 miles offshore from the Quinault Indian Nation village of Taholah. Because meteors enter the atmosphere at a downward angle, they are easy to distinguish from weather systems that move horizontally, he explained. Based on the radar signals, Fries calculated about 2 tons of rock survived the fiery plunge and scattered across a patch of seafloor about a half-mile wide. Some of the fragments are as big as a brick. Fries has helped organize about two dozen successful meteorite scavenger hunts across the county, but all of them were on land. 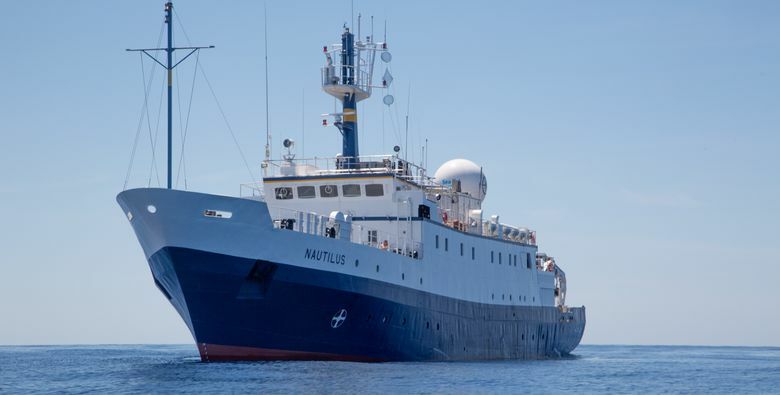 A sea hunt is only possible because a nonprofit research ship, the Nautilus, is serendipitously in the midst of a survey mission off the Northwest coast. “The meteor just happened to fall in the exact spot for all of this to work,” Fries said. The 211-foot vessel is operated by the Ocean Exploration Trust (OET), founded by explorer Robert Ballard, who located the wreck of the Titanic. The crew agreed to devote a day — and their sophisticated scanners and underwater robots — to the hunt. “It’s a great opportunity for us because it’s such an interesting, pure exploration type mission,” Nicole Raineault, OET’s vice president of exploration and science, said by phone Friday from the ship as it prepared to dock in Astoria, Oregon. 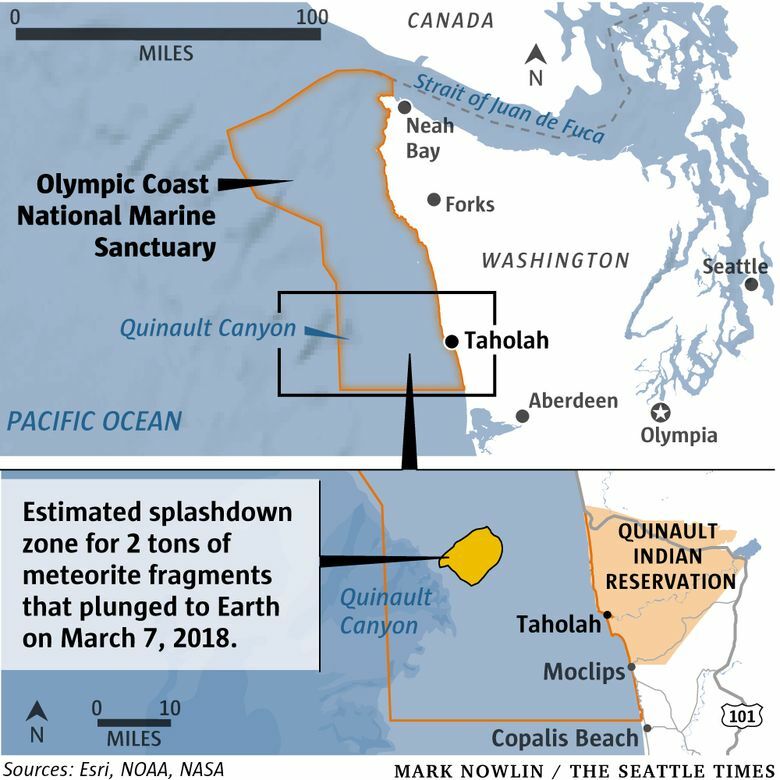 The meteorites fell near the head of an underwater canyon in an area where the water is about 400 feet deep and the seafloor is relatively flat, said Jenny Waddell, research coordinator for the Olympic Coast National Marine Sanctuary. That means there’s a good chance the black rocks will stand out against the light substrate — making the search less of a needle-in-a-haystack proposition. “I think it’s more like a rake in a haystack,” said Waddell, who helped connect Fries with the Nautilus. The ship first will scan the area with its sonar, looking for ripples, depressions or hints of anomalous-looking rocks, Raineault explained. Then crew members will deploy autonomous underwater vehicles equipped with cameras and tools to scoop up fragments. Since most meteorites are magnetic, the team is fashioning a magnetic wand to fish around in the sediment. The search will be streamed live online starting at about 9 a.m. Monday. “The public can watch the whole thing unfold,” said Waddell. Any meteorites collected will be sent to the Smithsonian Institution, which houses the national meteorite collection. For scientists like Fries, meteorites are fascinating because they are bits of original material left over after the planets coalesced. “It’s a piece of the history of the solar system we can’t get any other way,” he said. Radar analysis has allowed Fries to direct others to the site of multiple meteorite falls, like the one that struck northeast of Sacramento in 2012. But the six times he has gone out to search in person, his companions did well while Fries was skunked. He’ll be on the Nautilus this week, and he hopes the seventh time will be the charm.